Paradai II Thai Restaurant uses their own specialised couriers to deliver their food. Prawn base crackers served with peanut sauce. Crispy deep fried spring roll pastry filled with mince chicken served with sweet chili sauce. Crispy deep fried spring roll pastry filled with cabbage and carrot served with sweet chili sauce. Deep fried puff pastry filled with minces chicken potato and curry powder served with sweet chili sauce. Grill marinated meat served with peanut sauce. Thai style deep fried fish cake served with sweet chili sauce top with cucumber and peanut. Crispy deep fried spring roll filled with king prawn served with sweet chili sauce. Deep fried king prawn served with sweet sour tamarind sauce top with fried shallot and coriander. Spring roll, vegetarian roll, tod mun, curry puff and goong sabai. Deep fried bean curd served with sweet chili top with peanut. Deep fried prawn batter with shredded coconut and served with plum sauce. Thai style pan fried chives dumpling served with sweet and chili sauce. Pork scotch fillet marinated in Thai spices. Pulled pork with cucumber, coriander, chili, home made hoisin sauce and wrap with pancake serve with cracker. Homemade steam chicken dumpling with light soy sauce. Pork dumpling with sweet soy sauce and chili sauce. Thai style crispy pork served with hot chili sauce and homemade hoisin sauce. Tradition Thai spicy and sour soup with mushroom, tomato, lemongrass, lime leafs and coriander. Tradition Thai coconut and sour creamy soup with mushroom, red capsicum, lime leafs, lemongrass, galangal and coriander. Mild clear soup with vermicelli, white cabbage and spring onion. Mixed vegetable cabbage, carrot, iceberg lettuce, tomato, cucumber, boiled egg and steam chicken topped with peanut sauce. Minced chicken mixes with red onion, coriander, spring onion, mint, iceberg lettuce, lemon juice, rice powder and chili powder. Grilled beef mixed with red onion, tomato, cucumber, coriander, spring onion, mint, iceberg lettuce, lemon sauce, lemongrass, and chili paste and fresh chili. Mince chicken with steam prawn and calamari mixed with vermicelli, red onion, tomato, coriander, spring onion, iceberg lettuce, and lemon sauce and fresh chili. Grilled prawn mixed with red onion, tomato, cucumber, coriander, spring onion, mint, iceberg lettuce, lemon sauce, chili paste and fresh chili. Steam prawn, calamari and rockling fish mixed with red onion, tomato, cucumber, coriander, spring onion, mint, iceberg lettuce, lemon juice, chili paste and fresh chili. Minced chicken mixed with red onion, coriander, spring onion, cashew nut, ginger, iceberg lettuce, lemon juice, chili paste and fresh chili. Crispy pork salad with shred carrot, cherry tomato, red onion, Thai herb, cucumber, chilli and top with caramelized peanut in lettuce cup. Crispy skin five-spice duck with cucumber salad and sweet soy dressing serve with spicy tangy sauce. Thai style papaya salad with green paw paw, green bean, carrot, chili, garlic, plam sugar, fish sauce and lemon juice. Coconut milk with homemade yellow curry paste, pumpkin, green bean, cherry tomato and mint. Coconut milk with green curry paste, pumpkin, zucchini, bamboo shoot, green bean, capsicum and basil. Coconut milk with red curry paste, pumpkin, zucchini, bamboo shoot, green bean, capsicum and basil. Coconut milk with mild panang curry paste, cashew nut, capsicum and basil. Coconut milk with massaman curry paste, cashew nut, potato, pineapple and onion. Coconut milk with red curry paste, apple, pineapple, lychee, cherry tomato, snow pea, capsicum and basil. Coconut milk with homemade curry paste, potato and topped with fried shallot. Thai Style Braised Pork Belly it features the most basic Thai flavors: pepper coriander and soya sauce. The gravy is sweet due to the generous use of palm sugar and is savory, peppery and garlicky. Beef short rib braised for 6 hours with herb and spices and steam vegetable serve with hot and sour sauce. Stir fried with chilli paste, onion, broccoli, cauliflower, carrot, capsicum, onion, spring onion and cashew nut. Stir fried with mix vegetable, onion, broccoli, snow pea, spring onion and Chinese broccoli. Stir fried red curry paste with coconut milk, crushed chilli & garlic, bamboo shoot, green bean, baby corn, capsicum, basil, lemon grass and lime leaf. Stir fried mixed vegetable broccoli, cauliflower, carrot, baby corn, snow pea, Chinese cabbage and Chinese broccoli with garlic and oyster sauce. Stir fried mixed with ginger, garlic, onion, baby corn, carrot, snow pea, pineapple, capsicum and spring onion. Stir fried crushed chili and garlic, green bean, bamboo shoot, broccoli, capsicum and basil. Stir fried meat with garlic and black pepper serve with steam broccoli, cauliflower and carrot. Grilled marinated meat served with iceberg lettuce and sweet chili sauce. Marinated chicken thigh with lemongrass and herbs serve with Thai sour and spicy sauce. Stir fried with onion, broccoli, cauliflower, carrot, baby corn, spring onion, capsicum and mixed with peanut sauce. Stir fried with onion, garlic, carrot, baby corn, snow pea, tomato, cucumber, pineapple, capsicum, spring onion and tomato sauce. Stir fried with red chili & garlic, onion, snow peas, capsicum and spring onion. Deep-fried hard-boiled egg topped with tamarind sauce mixed with shallots and coriander. Steamed custard red curry paste, egg and coconut milk mixed with prawn, calamari and rockling fish serve with white cabbage, capsicum and basil. Stir-fried seafood prawn, calamari and rockling fish mixed with vegetable, milk, curry powder and egg. 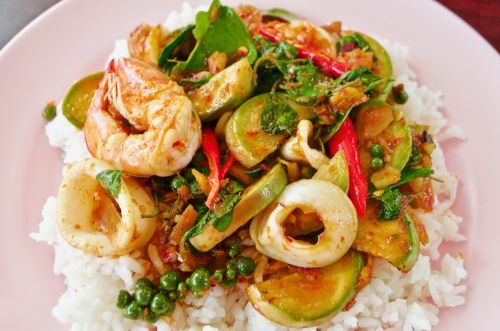 Stir fried prawn and calamari mixed with sweet chili paste, onion, capsicum and spring onion. Deep fried crispy rockling fish serve with iceberg lettuce and sweet chili sauce. Steamed fish top with chili, garlic, lemon juice and coriander serves with steam broccoli, snow pea and Chinese broccoli. Deep fried crispy fish served with fried egg noddle and sweet sour tamarind chili sauce mixed with slice chili and garlic. Stir fried rice noodle with egg, peanut, tofu, bean shoot and spring onion. Stir fried flat rice noodle with egg, carrot and Chinese broccoli. Stir fried flat rice noodle with egg, crush chili, bamboo shoot, green bean, Chinese broccoli, spring onion, capsicum and basil. Stir fried round egg noodle with egg, broccoli, cauliflower, carrot, baby corn, spring onion, capsicums, white cabbage and Chinese broccoli. Thai style fried rice with egg, onion, carrot, spring onion and Chinese broccoli. Thai style fried rice with egg & garlic, onion, pineapple, spring onion and cashew nut. Deep fried soft shell crab mixed with green apple, cherry tomato, chili, coriander, mint, lime leaf, spring onion, red onion on a bed of lettuce served with Thai spicy sour sauce top with fried vermicelli. Deep friend soft shell crab marinated with pepper and garlic served with steam vegetable. Stir fried deep fried soft shell crab mixed with green bean, red capsicum and mild coconut chili paste. Crispy whole barramundi with red curry paste green peper corn, krachai, Thai herb and crispy basil. Crispy fish fillet with red curry paste, coconut milk, kaffir lime leaves and chili ans served with steam broccoli. Deep fried marinated salt & pepper calamari with homemade chilli mayo. Stir-fried prawn, squid, scallop cooked with onion, spring onion, green pepper corn, krachai, herb, chilli, baby corn, capsicum and basil. Stir fried prawn and squid with tom yum paste and baby corn, snow pea, chili, mushroom, tomato, onion, spring onion and Thai herbs. Serve with zucchini, green bean, chili, thai eggplant, kaffir lime leaf and red capsicum. Batter deep fry banana serve with vanilla ice cream and golden syrup. Steam sticky rice, coconut, banana and wrap with banana leaf serve with vanilla ice cream. Deep fried banana wrap with fresh roti serve with vanilla ice cream and condensed milk.